Sat., 17 Aug. - Sun., 1 Sep.
See all 148 properties in Los Angeles - Ontario Intl. Situated near the airport, this hotel is 0.2 mi (0.3 km) from Ontario Convention Center and 3 mi (4.9 km) from Citizens Business Bank Arena. Museum of History and Art is 2.4 mi (3.9 km) away. 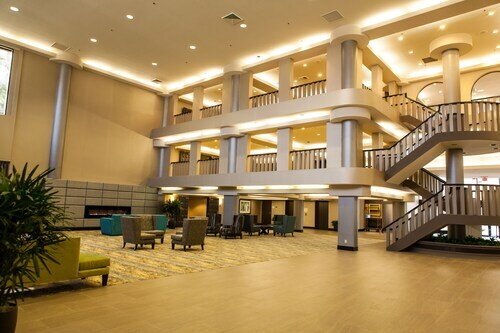 Located across the street from the Ontario Convention Center, this 3-story hotel is a half-mile from the Ontario Airport and within 5 miles of Ontario Mills Mall and Empire Lakes Golf Course. Situated near the airport, this hotel is 0.4 mi (0.6 km) from Ontario Convention Center and 2.5 mi (3.9 km) from Museum of History and Art. Ontario Mills Shopping Mall and Citizens Business Bank Arena are also within 6 mi (10 km). 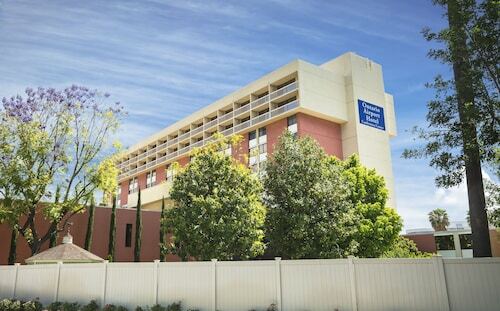 Located within 2 blocks of Citizens Business Bank Arena, this Ontario, CA hotel is 4 blocks from Ontario Mills Mall and 2 miles from the Ontario International Airport and Ontario Convention Center. 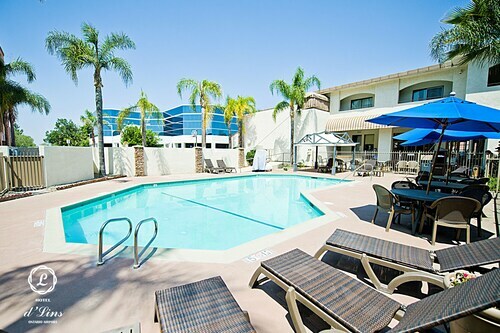 Situated near the airport, this hotel is within 3 mi (5 km) of Citizens Business Bank Arena, Ontario Mills Shopping Mall, and Ontario Convention Center. Scandia Amusement Park is 2.7 mi (4.3 km) away. 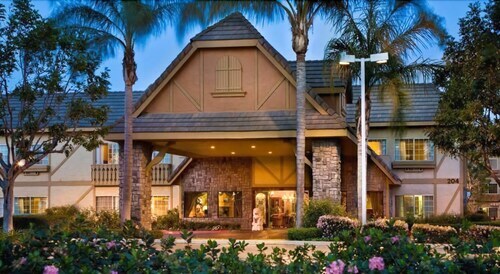 Situated near the airport, this hotel is within 3 mi (5 km) of Citizens Business Bank Arena, Ontario Convention Center, and Ontario Mills Shopping Mall. Scandia Amusement Park is 2.9 mi (4.6 km) away. 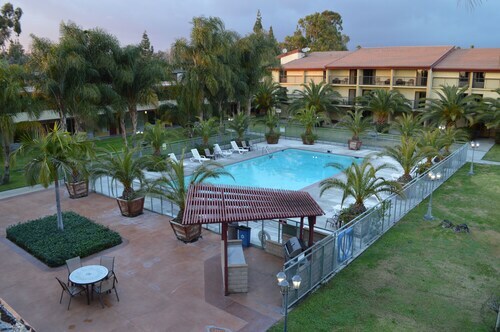 Situated near the airport, this hotel is 0.8 mi (1.2 km) from Ontario Convention Center and within 9 mi (15 km) of Ontario Mills Shopping Mall and Chaffey College. Victoria Gardens and Auto Club Speedway are also within 9 mi (15 km). 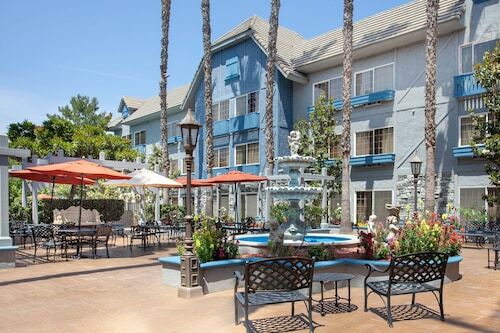 Situated near the airport, this hotel is within 3 mi (5 km) of Citizens Business Bank Arena, Ontario Convention Center, and Ontario Mills Shopping Mall. Scandia Amusement Park is 2.2 mi (3.6 km) away. Question : What is the cheapest date to fly to Ontario? Answer : As of Apr 22nd, the best day for booking to Ontario (ONT) is May 1st. A ticket will cost you $385, which is 25% less than this route's average price. Question : Is there an alternative airport near Ontario? Answer : There is another one outside Ontario. John Wayne Airport (SNA) is 30 miles away from ONT, and over the next two months flights are being booked 35% cheaper than flights to Ontario International Airport. Question : What is the cheapest airline flying from Kelowna to Ontario? Answer : Alaska Airlines is the leader in keeping prices down for their passengers over the next three months. Bookings are being made at just $385 and, when compared to the high-end bookings of $644, it's a terrific bargain. Answer : The cheapest day to fly from Kelowna to Ontario is on Wednesday. If you are trying to save a bit of cash on your next trip look for flights on Wednesday. Question : How much is a plane ticket to Ontario (ONT) from Kelowna (YLW)? Answer : Cost can range from $385 to $644, prices for YLW to ONT change less than most routes from Canada. However, usually the sooner you book, the better price you get. Question : How long do most people stay on their visit to Ontario on average? Answer : Of course, you're not most people, but if you were, you'd stay about four days.